Dr. Cornel Pewewardy combines creativity and a musical ear to produce traditional and contemporary Indigenous music that appeals to a broad range of audience tastes. Either playing his native flute or singing Southern Plains' songs on the "big drum," his music conveys a sense of serenity, beauty, and harmony between nature and humanity. Cornel's music is a reflection of a tribal knowledge base—always learning and honing his music, and finding personal peace through the creation of pleasing songs. Oyate Ump Moni is Dr. Cornel Pewewardy's Dakota name. Meaning "a leader among the people," he received this name through a Dakota name-giving ceremony while he was living in Minnesota. 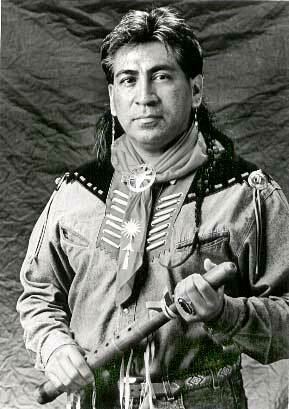 Cornel is Comanche and Kiowa and enrolled member of the Comanche Tribe of Oklahoma. Growing up in Southwestern Oklahoma, Cornel followed the collective talents, artists and musicians of his extended family. From this exposure, Cornel learned at an early age of his cultural ancestry and rich tribal background. Brought up on the "drum" offered internal, appreciation and luminescent spirituality that comes from singing long hours with renown, masters of the Southern Plains' song composers. The wistful simplicity of his songs give a subtle yet unmistakable powerful expression. Cornel's strength is his tribal voice whose chants can be heard on his individual solo recordings with Sound of America Records to background harmonizing with Robbie Robertson's "Under Sea World of Red Boy" with Capital Records. His flute plays a major role in his music as well. His native flute come from the inspiration of Kiowa flute player, Woody Big Bow and Comanche artist, Woogie Watchetaker. His music has been widely displayed throughout United States and Canada. In his performances he continue to stretch his horizons through practicing, composing, and teaching. Working with students, he says, helps him clarify for himself the important and often subtle nuances that make a good song. Cornel Pewewardy has taught Native American music and dance at the University of New Mexico and Navajo Community College. Now living in Lawrence, Kansas, Dr. Pewewardy is an Assistant Professor in the Department of Teaching and Leadership, School of Education at the University of Kansas. He teaches courses in multicultural education and Indian education. His adjunct instructor appointments include Harvard University School of Education Summer Principals' Institute; Union Institute; University of Minnesota, University of Oklahoma, Cameron University, University of Sciences and Arts of Oklahoma, and Haskell Indian Nations University. Dr. Pewewardy received his Bachelor of Science (1976) in Elementary Education and Master of Education (1977) in Guidance and Counseling from Northeastern Oklahoma State University in Tahlequah, OK. Cornel earned a Masters of Arts (1980) in Educational Management and Development from New Mexico State University in Las Cruces, NM, and Educational Specialist Certificate (1986) in Educational Administration from the University of New Mexico in Albuquerque, NM. Dr. Pewewardy earned a Doctorate of Education (1989) in Educational Administration from The Pennsylvania State University in State College, PA. From 1989-1990, Cornel received a post-doctoral fellowship in the Center for Research on Multi-Ethnic Education from the University of Oklahoma in Norman, OK. In 1990 Dr. Pewewardy was the founding principal of two transformational, award-winning magnets schools in the Saint Paul (MN) Public Schools District: The World Cultures and Languages Magnet School and American Indian Magnet School. Cornel is also a former elementary teacher and principal on the Navajo Reservation in New Mexico. He now serves as educational consultant to numerous school districts across the country on improving the academic achievement of underrepresented populations in education and faculty curriculum development. His research agenda is studying the psychological impact upon children's academic achievement caused by ethnic stereotyping. Cornel Pewewardy dedicates his music to the memory of those many prominent Southern Plains' singers and composers from Oklahoma and the Southwest. He hopes to promote and perpetuate their songs so that the younger generation will be able to enjoy, love, and understand cultural celebrations. Cornel received the 2001 and 1999 Big 12 Outstanding Indian Faculty Member of the Year; 2000 Wordcrafter of the Year and the 1997 Musician of the Year from the Wordcraft Circle of Native Writers and Storytellers ; 1994 Bush Principals' Leadership Program, University of Minnesota; 1993 Hubert H. Humphrey Fellow, HHH Institute of International Affairs, University of Minnesota; 1992 National Committee for School Desegregation Award; 1991 National Indian Educator of the Year and 1988 National Indian Student of the Year both from the National Indian Education Association. In 1998 Cornel was presented the Phoenix Award for Music by the Lawrence (KS) Arts Commission. The Warrior's Edge , with the Alliance West Singers, Shortwave Records. Between Father Sky and Mother Earth , with other artists. Dancing Buffalo: Dances and Flute Songs . Commanche Hymns from the Prairie , SOAR. This is an "official" site in that this page was constructed with the assistance and active collaboration of the musician and educator, Cornel Pewewardy. © 2001 Cornel Pewewardy and Karen Strom.